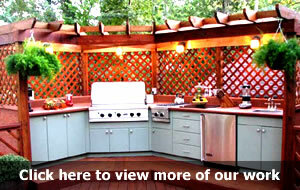 Today your outdoor kitchen and eating area is frequently the entertainment spot of your backyard. They showcase your home and landscape with a stylish designs, an array of accessories, bar, and comfortable dining areas. The outdoor kitchen is one of the most popular features in landscaping today and continues to grow in popularity. Cooking features include grills, ovens, and side burners. The grill can be totally custom, semi-custom, or a prefabricated built-in component. Wood fired outdoor pizza ovens are also becoming popular.